These examples are a testament to the variety of high quality white wines you can enjoy for negligible cost. All these wines are readily available from supermarkets or wine stores in the UK. Try the simple Berberana Marino with a fish course or the toasty Monopole with a roast pork dish and be delighted with the partnerships. Every one of the wines below are wonderfully tasty and incredible value for money, why not aim to sample them all over the next few months! Penedes is a large region and highly regarded as one of the most up-to-date and innovative wine producing areas. One of the best known growers is the house of Torres, who produce the Gran Vina Sol, a popular feature in most UK wine shops and supermarkets. It is blend of mostly Chardonnay with 15% of the local Parellada which creates a powerful and elegant drink. A lively freshness is supported by a lavish fruitiness ideal as either an aperitif or with seafood and fish dishes. A rich, dry white wine from the heart of Rioja, using viura grapes to produce one of the world's best-selling white riojas. 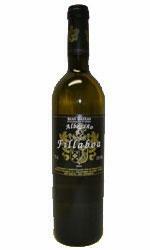 This wine is made from 100% Viura grapes and has a clear, pale straw and yellow colour. The nose is complex and filled with spicy aromas, oak, green apple, and a floral tone. In the mouth, fruit acidity will make your tongue and cheeks take notice. Flavours included green apple to mild citrus; vanilla and toasted oak tones are present. The finish is brisk, dry, with light fruit and some warmth. A converted farm of 27 hectares (66.7 acres) situated on the rivers Minho and Tea, was given over to the sole production of Albariño grapes. It produces great fruit with oily lemon hints and very clean and refreshing wine. Overall colour is yellow green with aromas of exotic flowers, and taste is definitely zesty and racy in style. A light, delicate white wine with an intensely aromatic bouquet (courtesy of the Verdejo grape variety) and bursting with fruit. The acidity is well balanced to give a crisp finish. This is a great example of traditional white Rioja from Bodega Muga. 100% barrel-fermented in new oak the wine offers plenty of complex zesty lime flavours with a gorgeous spicy oak finish. 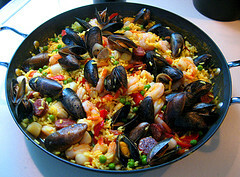 Drink with full-flavoured fish dishes such as Paella. 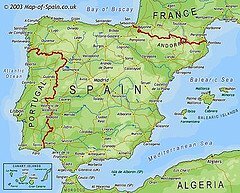 "A great everyday wine made in the Tarragona region of eastern Spain, an historic winemaking area that has been producing wine since Roman times. This is produced mainly from a grape unique to Spain, the zesty Macabeo, rounded out with a touch of Chardonnay. 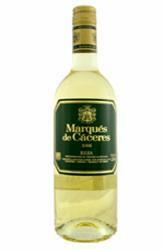 The Macabeo gives this wine a crisp flavour, softened by the peachy influence of the Chardonnay." This is a simple, fruity wine whose grapes are sourced from various regions of spain. If you want a reliable mediterranean style drink made using modern techniques look no further. Berberana Wineries originated in a small family winery in Ollauri in the Rioja Alta Region in 1877. The Viura grape produces a marvellously rich and creamy, soft-fruit style white Rioja that is full of elegance and charm. Immediate citrus character on the palate, this wine benefits from fermentation in cask, which rounds out the palate. A persistent finish that comes from integrated mild toasty oak. It was winner of an IWC Bronze medal for its 2004 vintage. 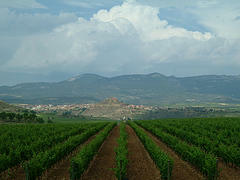 - Enjoy Rioja’s varied scenery, fine wine and delicious food at your own pace. - Experience the flexibility and freedom of your own vehicle. - Combine walking, vineyards and culture with fine food and wine. Laymont and Shaw have recently been appointed UK distributor for Valdivia, the first sherry bodega to be founded in Jerez so far this century.